My Learn Zillion products are now FREE! Learn Zillion videos are a great learning tool. While they were once free, they now require a "Premium" subscription to view them all. They typically consist of 4-6 minute videos that teach students how to do specific Math skills that are all aligned with Common Core standards. 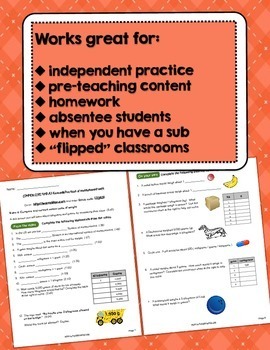 They work great for students who missed a lesson, for when you have a substitute, for home schooled students, and especially for those looking to try a “flipped” classroom concept. I like to assign these packet pages as homework, but they can be done independently in the classroom or with whole group as well. 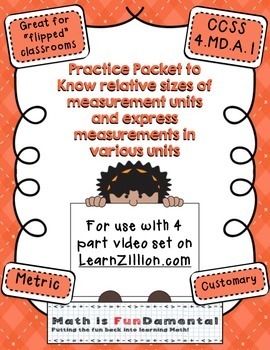 Students simply visit www.LearnZillion.com, type in the “quick code” on the sheet and watch the video teaching the skill. When they are done, they complete a problem or two using the skill taught and then use the “guided practice” video for help or to check their work. It’s that simple! Enjoy and please e-mail me should you have any questions.